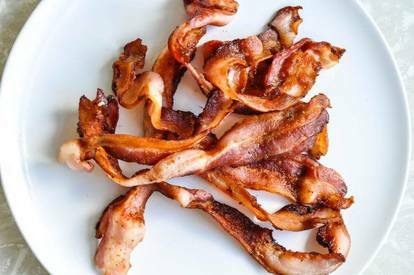 The Bacon Experiment was one lucky guy eating nothing but Bacon for an entire month. Two pounds of Bacon, or roughly 30 pieces, every single day. A Bacon Lovers dream or a nightmare? Dan Quibell, the man behind The Bacon Experiment, says: “The Bacon Experiment was me eating nothing but bacon for an entire month. Two pounds of bacon, or roughly 30 pieces, every day. The goal here was to get people’s attention using BACON, then try to teach them something about low carb and ketogenic diets and all the benefits that come with it. Cutting out carbs has been life changing for me and I wanted others to benefit as well. I expected that even though I was eating 2500 calories a day, an increase of 500 calories a day for me, that I would not gain much weight, I already knew that eating fat and protein doesn’t make you fat." Could you eat ONLY Bacon for 30 day straight?